With just 13 days to the February 16 presidential election, the dynamics of the race for the nationâ€™s top job indicate an interestingly tight and tough contest between the two leading candidates of the Peoples Democratic Party (PDP), Alhaji Atiku Abubakar and the ruling All Progressives Congress (APC), Muhammadu Buhari. 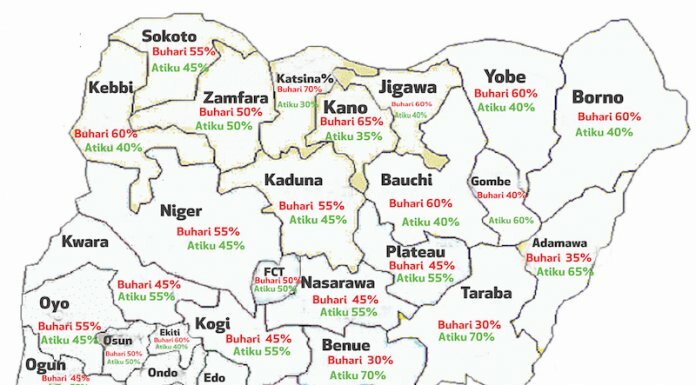 THISDAYâ€™s recent field intelligence gathering, which reports a tight and tough contest, however, presents both state-by-state and geo-political zones analyses of what is obtainable by each of the two front-runners in the states, thus giving an evolving picture of what might ultimately be the regional standing of the candidates and their parties. In the Kano, for instance, the race pictures a 65 per cent victory for Buhari and 35 per cent for Atiku. In Kaduna, while Buhari is likely to get 55 per cent of the votes cast, Atiku may post just 45 per cent. The race in Katsina is a no-contest as Buhari is sure to secure 70 per cent to Atikuâ€™s 30 per cent. In Sokoto, Buhari manages an edge over Atiku with 55 to 45 per cent sharing, but in Zamfara, the contest promises a 50-50 contest. Kebbi looks comfortable for Buhari with a 60 per cent advantage over Atikuâ€™s 40 per cent. Buhari is also certain to prevail in Jigawa with a 60/40 margin over Atiku. The dynamics in North East varies differently from the North-west, because here, in Bauchi for example, Buhari is sure of some 60 per cent to Atikuâ€™s 40, while in Borno and in spite of the growing insurgency, the votes may still go the way of Buhari, also with 60 to 40 per cent voting. Atiku will put up a good showing in Adamawa with a 65 per cent advantage, leaving Buhari with 35 per cent. Moving on to Yobe, Buhari is positioned to score 60 per cent, leaving 40 for Atiku and the same equation is shared in Gombe â€“ 60/40 â€“ however in favour of Atiku. But the Taraba contest is a different one as it sees Atiku coasting home with 70 per cent and 30 per cent for Buhari. Kogi Stateâ€™s battle also looks good for Atiku even though with the same 55/45 sharing formula. But Niger might go the way of Buhari with 55 per cent to Atikuâ€™s 45 per cent. However, Kwara is solidly PDP and would deliver Atiku but with 55 per cent to Buhariâ€™s 45 per cent. Considered the real battleground because of the number of votes that is up for grab, the race in South-west is unavoidably tight. In Oyo, for example, Buhari will certainly top with 55 per cent, while Atiku gets the remaining 45 per cent of the votes. But in Osun, the situation is too close to call and might flip either way. Itâ€™s a 50/50 chance. The Osun equation is unlikely to be repeated in Ondo, which may give Buhari 55 per cent and Atiku 45 per cent. Buhari appears comfortable in Ekiti, where he may likely get his highest votes in the zone with 60 per cent to Atikuâ€™s 40 per cent. Interestingly, however, Ogun too may go the way of Atiku with 55 per cent to Buhariâ€™s 45 per cent, because of the many factors that are currently playing out in the state. But the Lagos battle is a 50-50 ratio. The dynamics are quite intricate. Curiously, the South-west goes the way of Atiku with three states to Buhariâ€™s two, while drawing in one, Lagos. Starting with Imo, the heartland of the South-east, Atiku is sure of at least 60 per cent of the votes with 40 per cent concession to Buhari. The same ratio is obtainable in Abia, Godâ€™s own state: 60-40 in favour of Atiku. Ebonyi too is sharing her votes in the same 60-40 pattern, also in favour of Atiku, while Enugu, which is South-eastâ€™s safest state for the PDP, boasts 70 per cent for Atiku and 30 per cent for Buhari. In Anambra, where Peter Obiâ€™s home-zone advantage is certain to work for Atiku, the PDP candidate stands to get 60 per cent votes to Buhariâ€™s 40 per cent. The final analysis in this zone sees Atiku clearing all the five states. Edo will deliver the PDP with 55 per cent, leaving Buhari with the remaining 45 per cent. In Delta, the PDP will post some 75 per cent for Atiku and 25 per cent for Buhari, while Bayelsa, though with a relatively small voting strength, will hugely deliver Atikuâ€™s PDP with 80 per cent, leaving the remaining 20 per cent for Buhari.